Have you lost a tooth? A person can easily lose a tooth or a few teeth for all kinds of reason. He may have lost it after an accidental blow to the face; he may have lost it due to the tooth infection that was not earlier resolved; or he may have lost it due to an awful progression of gum disease. Inasmuch as a dentist would like to be able to save a tooth, some teeth are simply geared towards an extraction, so the next step is to order a replacement with through dental bridge or dental implants. La Mesa dentists stress on the importance of prosthetics because countless changes occur following the loss of the tooth or teeth. After a tooth is lost the adjacent teeth may drift, and the opposing teeth may supraerupt. If allowed to progress further, the bite may change completely, affecting the tempormandibular joint (TMJ), so causing a disorder and the integrity of the facial tissues become greatly compromised. By ordering a dental implants or a dental bridge, La Mesa patients are able to avoid all the unnecessary trouble mentioned above. The first step of treatment begins with a choice: should you get dental bridges or dental implants? La Mesa patients that take time to discuss their options with their dentists should easily make this decision. When patients are given the entire picture, they will be rewarded with the opportunity to make a sound decision. Dental bridges are more affordable compared to dental implants, so more people are able to choose this as a prosthetic option. It is affordable because the process is less complicated and the materials and equipment used are not as expensive. Dental bridges are easier and faster to make. Dental implants rely on true stability for it to be deemed successful, so there is a period when the status of the implant within the bone is looked after well closely. Dental bridges do not go through this at all. As a matter of fact, with CAD CAM CEREC, it is possible for patients to have dental bridges on the same day they come into the clinic. Dental implants will not require any tooth reduction. 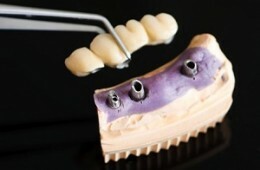 When dental bridges are prepared, any existing teeth should be drilled to get it ready to receive the bridgework. This may mean having to touch a sound tooth. Dental implants preserve the health of the bone especially when the implants are inserted as soon as the tooth is extracted. By virtue to bone remodelling after extraction, bone resorbs bone height, width and length is lost. This is prevented with dental implants because the presence of the implant puts resorption at a minimum. Dental implants offer true function and stability. As long as the implants are able to osseointegrate with the bone, one can truly enjoy stability that you can never find in any other prosthetic option. This means that aesthetics and function is also very superior.